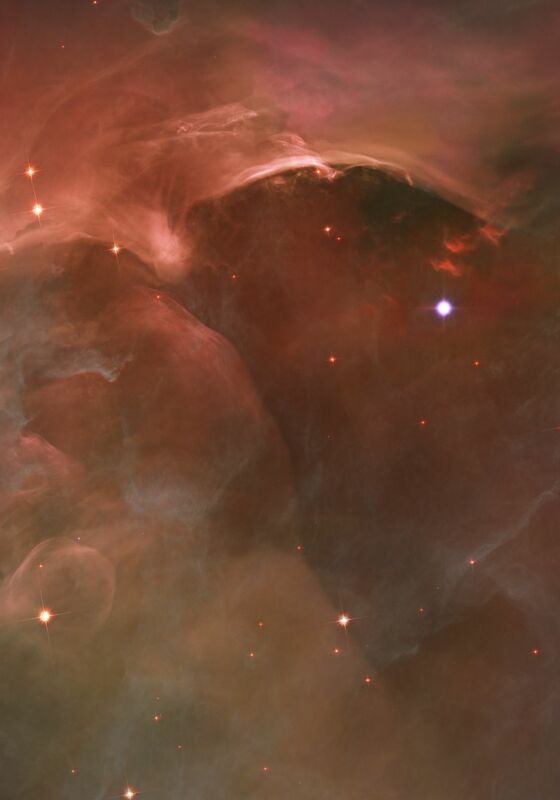 In one of the most detailed astronomical images ever produced, NASA's Hubble Space Telescope is offering an unprecedented look at the Orion Nebula. This turbulent star-formation region is one of astronomy's most dramatic and photogenic celestial objects. The crisp image reveals a tapestry of star formation, from the dense pillars of gas and dust that may be the homes of fledgling stars to the hot, young, massive stars that have emerged from their gas-and-dust cocoons and are shaping the nebula with their powerful ultraviolet light. The new picture reveals large-scale structures never seen before, according to C. Robert O'Dell of Vanderbilt University in Nashville, Tenn. "Only with the Hubble Space Telescope can we begin to understand them," O'Dell said. In a mosaic containing a billion pixels, Hubble's Advanced Camera for Surveys (ACS) uncovered 3,000 stars of various sizes. Some of them have never been spied in visible light. Some are merely 1/100 the brightness of stars seen previously in the nebula. Among the stars Hubble spotted are possible young brown dwarfs, the first time these objects have been seen in the Orion Nebula in visible light. Brown dwarfs are so-called "failed stars." 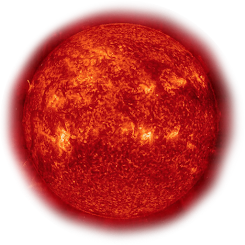 These cool objects are too small to be ordinary stars because they cannot sustain nuclear fusion in their cores the way our Sun does. The Hubble Space Telescope also spied for the first time a small population of possible binary brown dwarfs — two brown dwarfs orbiting each other. comparing the characteristics of newborn stars and brown dwarfs in their natal environment provides unique information about how they form. "The wealth of information in this Hubble survey, including seeing stars of all sizes in one dense place, provides an extraordinary opportunity to study star formation," said Massimo Robberto of the Space Telescope Science Institute in Baltimore, Md., and leader of the observations. "Our goal is to calculate the masses and ages for these young stars so that we can map their history and get a general census of the star formation in that region. We can then sort the stars by mass and age and look for trends." Robberto will present his results on Jan. 11 at the 207th meeting of the American Astronomical Society in Washington. The Orion Nebula is a perfect laboratory to study how stars are born because it is 1,500 light-years away, a relatively short distance within our 100,000 light-year wide galaxy. Astronomers have a clear view into this crowded stellar maternity ward because massive stars in the center of the nebula have blown out most of the dust and gas in which they formed, carving a cavity in the dark cloud. "In this bowl of stars we see the entire star formation history of Orion printed into the features of the nebula: arcs, blobs, pillars, and rings of dust that resemble cigar smoke," Robberto said. "Each one tells a story of stellar winds from young stars that impact the stellar environment and the material ejected from other stars. This is a typical star-forming environment. Our Sun was probably born 4.5 billion years ago in a cloud like this one."